SAUGERTIES – On Saturday, July 29, 2017, Course Designer Rian Beals transformed the Grand Prix Stadium at HITS-on-the-Hudson into an elegant track of natural obstacles, befitting that of an open Hunt Field. An enthusiastic crowd of spectators dotted the HITS signature berms, as VIP Patrons met at their white clad tables, all gathered to witness 36 beautifully appointed riders atop their elegant mounts compete for one of the most prestigious Hunter competitions, the $50,000 USHJA International Hunter Derby. Unique to the Derby format, in addition to the base score, two Judging Panels awarded an Option Bonus Score, which granted one additional point for each higher-height fence option jumped. When the top 12 Horses and Riders with the highest scores returned for the Second Round, judges awarded a Base Score, Option Bonus Score, and a Handy Bonus Score. Texas-based Equestrian Tracy Fenney garnered the win with MTM OUTBID, and also collected the Fifth-Place prize riding MTM FASHION, both horses owned by MTM Farm. Fenney’s star student, Brian Moggre who is 15 years old, earned top honors on Abigail Albrecht’s MTM NAMEWORTHY in the Classic Round of the Derby, but in the Handy Round made a long-distance choice which resulted in a playful landing that looked fun to ride, but didn’t score well on the Judge’s Card. Ultimately, Moggre and MTM NAMEWORTHY placed seventh in the overall standings. 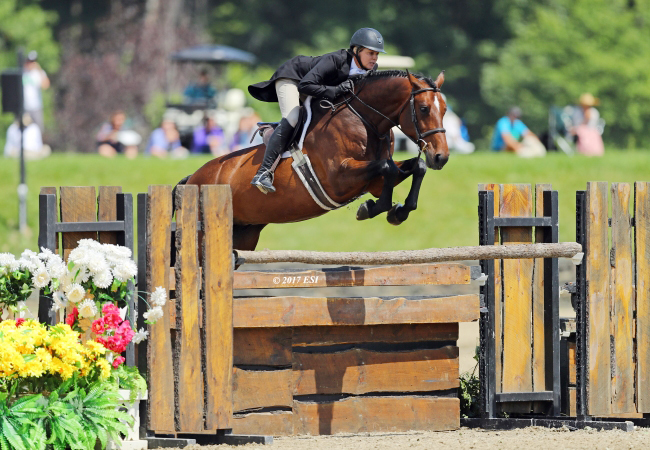 In the Classic Round, Fenney and MTM OUTBID, had earned a score of 175, which placed the pair in Third. Patricia Griffith and SKOREKEEPER scored 177, and Moggre and MTM NAMEWORTHY received the highest score of 180.50. Fenney opted for all of the inside turns and high options with MTM OUTBID in the Classic Round, and again in the Handy Round. The Judges rewarded Fenney’s choices, and MTM OUTBID’s brilliant performance with a second-round total score of 208 – the highest score of all to be awarded in all rounds, producing an overall high score of 383. Griffith and SKOREKEEPER delivered a graceful performance in the Handy Round, and the stylish pair from Heritage Farm earned a score of 193.5 for an overall score of 370.5 which maintained their second position.THE EXCHANGE, ridden by Kristy Herrera, who sat in Fifth Place after the First-Round with a score of 171.000, made use of the bonus options in the Handy Round and impressed Judges enough to earn a score of 196.000, for a total overall score of 367.0 for Third Place. Fenney’s fifth place ride, MTM FASHION, was in Fourth Place after the first round with a score of 171.5, then earned a second-round score of 186.0, for a total overall score of 384 which collected the pink ribbon.